Everyone in Oshkosh said the Cub flight home would take longer than the flight out.... there will be headwinds instead of tailwinds. Mark and I had to come home. The rest of the Cub team brought her home. Let me brag on them a bit and tell you that Jack (and Carol) got Runner Up in the Antique Awards, Bronze Age (1937-1941) Division for their restoration effort. Very exciting since they did the entire restoration of the Cub by themselves in their garage and hangar. They packed up the RV, stowed their plaque safely away and started the adventure home. They took the northern route back so they could see a different section of the country. Jack and Carol thought they would wait until Monday to leave... that way they could avoid the frenzy of Oshkosh departure day. 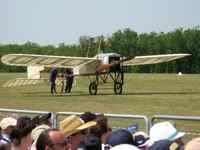 If you've ever been to a major fly-in, you may have an idea of what that really means.... but remember Oshkosh is the biggest aviation fly-in in the world. And THAT means it has the biggest departure day in the world. They did take-off just fine from Oshkosh. They forgot to turn the "Spot" tracker on at take-off, so it showed them starting from Ripon. Mark and I were not with them on this leg, so I had to wait for them to phone in the reports when they could find reception for their cell phones. From what we could tell following along on "Spot", they made good time. After cleaning up the motor home, we were off for the airport by 8:00. Time for the Cub flight home. Jack loaded the airplane and we taxied out about 8:30. The FAA had personnel along the taxi way and directed us by hand signals to the runway. We were cleared into position on the right side of the right runway..... yep, an RV 10 was lined up on the left side of the same runway! 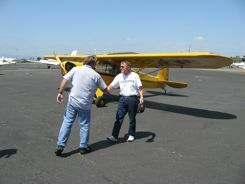 As soon as the RV had cleared the runway, the Cub was cleared for takeoff, and we started our flight heading for home. We expected winds going west but after departing Oshkosh, we found 15 knot headwinds... not good anytime and especially in a J-3 Cub. The GPS indicated that our first leg was going to take 3 hours. After flying for 30 minutes and encountering those pesky head winds, the GPS indicated we had 3 hrs and 30 minutes left on that leg. WHAT??? Could we really be going backward; no, just decreased ground speed. We made a stop for fuel half way and flew on to Springfield, MN. Not as far as we had hoped but a good start for the trip. We found a nice campground for the motor home and settled in. After a great BBQ we all were really tired and went to bed about 9:30. There had been lightening spotted in the distance and the light show was appreciated…at least until about 10:00 when we were awoken by a knock on the door from the local police. They had come to warn us that the area was under a thunderstorm warning, and it could produce hail and possibly a tornado. The officer offered to open the basement to City Hall and turn on the lights so we could stay there should the storm become worse. We thought about it for a few minutes and decided we would drive to city hall and be close in case things really turned bad. We closed up the beds, pulled in the motor home slides and off we drove to City Hall. The hail did start to come down and the rain was heavy but, thankfully, no tornado. Jack was worried about the airplane so from city hall, we drove to the airport to check on the Cub. By the time we got to the airport, the storm had passed and Jack had a chance to look the Cub over and was very relieved to find there was no damage. 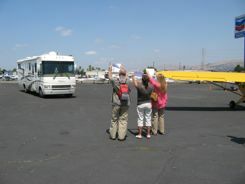 Since we were there, we decided to park the motor home at the airport and spend the night there. The rest of the night was peaceful after the events of the earlier evening. I'll have to revise this later... I just got a call from Carol. Garbled reception to say the least, but here's what I think happened. They made it to Springfield, Minnesota last night. From the "Spot" map it looked to me like they were out in the middle of nowhere! Carol says that's right!! They did find a cute campground, and settled in for an early night since they like to start flying early. Apparently at 10 last night, someone came banging on the RV door to tell them about thunderstorm warnings and a hurricane building??? I thought those were in the Gulf. Well, reception WAS garbled. They are fine, and the Cub is fine, and they are into South Dakota and on the move. When I get clarification and more information, I'll let you know what really happened. And photos... they promised to e-mail photos. Keep your fingers crossed, I want to see them too! Looks like they've stopped for the night in Pierre, South Dakota... everyone remembers that's the state capital, right? And hardly a speck on the "Spot" map! No report yet, but I'm thinking they should have cell phone reception and internet access... but then we thought we'd have that in Oshkosh. We woke up to hazy skies but seeing the Cub parked just outside the motor home was nice. After breakfast, we were ready to hit the skies for the next leg of our journey. What a pretty picture the surrounding area was. Green corn fields with a great farm house and barn just behind it. The local airport geezers were there to see us off. When they saw me in my fishing vest, I explained that I wore it because there is no place to store anything in the Cub. Their response was “how ‘bout that”. They asked me if I flew and I said yes. Their response was “how ‘bout that”. I loaded myself into the airplane, Jack propped us and off we went. The haze seemed to be more of a ceiling, and it kept dropping. Before we it, we were flying about 300 feet off the deck. Fortunately, the weather lifted after about 20 miles, and we could start to climb. We notice the motor home under us so Jack decided to pay them a visit with a low strafing pass. OK, so maybe in a Cub it isn’t too scary, but it was fun for all of us. Jack and I played tag with the motor home all the way to Huron, SD where we landed and had lunch. Brian took the next leg with Jack and again, we played tag for a good part of the way. They landed in Pierre, SD and Judy, Jeremy and I were about 10 minutes behind them. 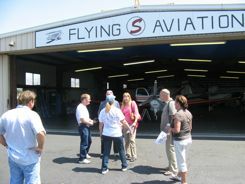 The airplane went into a hangar this time and it was a good thing. We pulled into a campground by a lake about 5 miles from the airport and the weather started to turn stormy. There were dark clouds, lightning and thunder and the ranger came to tell us that there was a thunder storm warning in effect and we could use the “comfort station” (the bathroom) as a storm shelter. Well, by now, we are old hands at this weather thing. There was a lot of lightning and thunder, some wind and rain, but the storm passed over in 15 minutes and we just continued with our barbeque and cocktails. We didn’t get as far as we had hoped but all in all, it was a good day. Another clear cool morning to start our next leg, so off we went to Pierre airport. Brian and Judy dropped us off and they left to start their driving trip. We set up the airplane, had it fueled, and off we went heading for our first leg which took us past Rapid City, SD and a pass past Mt. Rushmore. It is an impressive monument but from a mile away it seemed smaller than I expected. After flying past the monument, first stop fuel stop was Custer, SD. What a beautiful area! Lots of pine trees and mountains. The motor home was an hour behind us so we took off from Custer and headed toward Converse County airport which was about 80 miles of Casper, WY. Hmmm, I think we flew past the beauty of the Custer area and into the desolate area of Wyoming. Lots of dry plains. We did get fuel so we could start the climb into the eastern edge of the Rockies. We had favorable winds at the start of the day but after leaving Converse County, we hit 15 to 20 kt. headwinds. Between the winds, the altitude, the heat and two of us on board, the little Cub was really working. At times we were registering a 500 ft. per minute descent and looking at 45 MPH airspeed. Well dagnabit!! This Cub flight home could take a while! It was a long trip to Rawlings but we made it. Jack rocked! His landing was great... and they had been reporting winds of 22 kts on landing. We taxied up to the FBO, asked for fuel and a hangar. The attendant offered us a car to use but Brian and Judy had just pulled up in the motor home. What a welcome site. Jack and I had been in the airplane for almost 8 hours. Brian and Judy had driven even longer but we are all getting anxious to get home. We found an RV park and settled in for the evening. Tomorrow looks like Jack will being flying alone for a couple of legs, at least until we pass Salt Lake City. We will see what tomorrow brings. 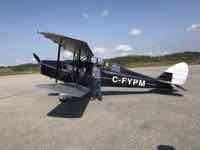 The Cub took off from Stead Airport Reno. They made it back to San Jose, CA at noon. True to form, the RV was only 20 minutes behind. We were at the airport to meet them with a greeting committee.... Mark insisted on score cards.... 10.0 for the Cub and the whole crew. Mark also had to present the "Key to the city.... restrooms". He figured that after three weeks of dumping RV toilets and Oshkosh portapotties, porcelain would be welcome! 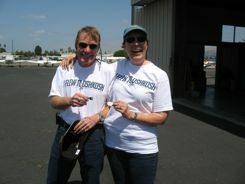 Note the "I Flew to Oshkosh" tee shirts... they earned them. 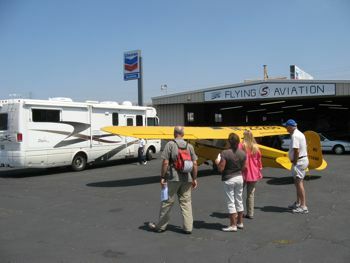 And one last photo of the Cub and the RV together at an airport... and what better airport than Reid-Hillview in San Jose, CA with Flying S Aviation in the background. That's the end of the adventure... all good intentions aside, we didn't manage to finish the "middle" stories, but we think you probably saw enough. Thanks for coming along on the Cub flight home.